I have 6 manuscripts sitting on my desk--one is a play, 2 are nonfiction and the other 3 are fiction. 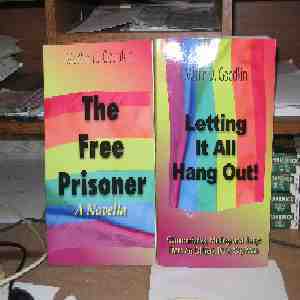 All in all I have 8 books published and I self published my last two. I wrote them all without any audience in mind--the one and only book I ever wrote with readers in mind was the last one published called "Letting It All Hang Out". I mainly wrote to clear my head of ideas that have been there for awhile. Even the non-fiction books which were motivational for people who wanted to lose weight were my thoughts on my battle with fat. Of the ones mentioned in the first paragraph the 3 I called fiction (and the play) are actually nonfiction (I don't remember the term Truman Capote used regarding "In Cold Blood")--though the characters are fictionalized (law suits, you know) the events, places, etc. are real. The one completely fictionalized is "...And The Oscar Goes to..." where I was trying to put my mind in a actresses point of view. "The Free Prisoner" --This was published in 2005 and, I think, my best book--it is about a gay boy in the Bronx 'coming out' in the 40s and 50s. "The Gay Pariahs" ) Gay life from the 1940s to the 1990s seen through the eyes of the main character and his friends, lovers, etc. "For What We Had" A true love story from the meeting of the 2 main characters through a newspaper ad and what leads to the breakup and the aftermath--told through letters, notes, cards, diaries, etc. "The Looks Of Love" 2 Gay, Jewish, Yankees move to the deep South in the 70s--though the relationship is a financial success it is a very destructive one. When you write who are you writing for?